VF Corp., the publicly traded parent company of brands such as The North Face and Smartwool that announced this week it is relocating its headquarters to Denver from North Carolina, is eying a building near Union Station. Currently based in Greensboro, North Carolina, VF Corp. signed a letter of intent for 285,000 square feet — the entire building — at 1551 Wewatta St., according to multiple sources familiar with the deal. CBRE broker Chris Phenicie, who represents the building’s owner, did not respond to requests for comment. 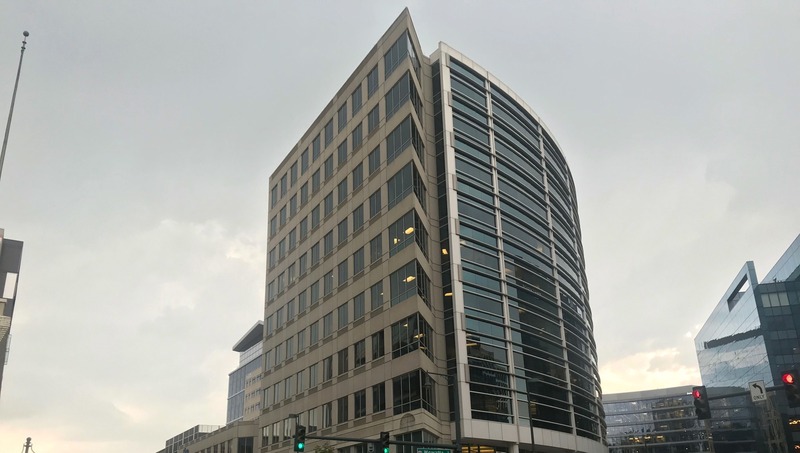 The building on the corner of Wewatta and 15th Streets, known as Gates Plaza, is currently home to staff of Denver-based DaVita, which plans to move out. Gates Corp. operated in the building before moving to 1144 15th St. earlier this year. Amazon also has been sniffing around for space in that building, according to multiple sources. If VF Corp’s deal turns into a lease, the company will become neighbors with Facebook, which is moving in next door at 1900 16th St.
VF Corp. announced Monday it is spinning off its denim and jeans brands into a yet-to-be-named company that will remain in Greensboro, and moving the headquarters for its outdoor brands — The North Face, JanSport, Smartwool, Altra and Eagle Creek — to Denver. The company said it expects its Denver workforce eventually will number 800. The Colorado Economic Development Commission approved $27 million in tax incentives to the company, according to the Denver Post. VF’s outdoor brands currently have their own headquarters. Steamboat Springs-based Smartwool is the lone Colorado brand. The North Face and Jansport will move from Alameda, California. Eagle Creek and Altra will move from Carlsbad, California and Logan, Utah, respectively. VF Corp’s 2017 revenue was $11.8 billion. Its other brands include Vans, Timberland and Dickies.